BM Catalysts Premium Catalytic Converter Cat. 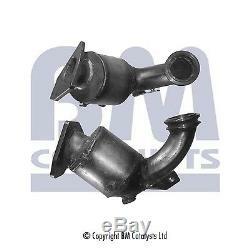 New to the BM Catalysts product offering is a range of DPF Pressure Pipes. Focusing on Cat and DPF solutions, its two hi-tech facilities in Nottinghamshire, England, bring innovative product development and precision engineering to the aftermarket. Technical Specification Inspection Tag: E9-103R. Equivalent Part Numbers AS: 21759D, 21766D, 21770D, ASSO: 44.001, BOSAL: 090-463, 090-464, 090-465, EuroFlo: ECFT1037TA, FIAT: 51777753, GT Exhausts: G321835, G321836, IMASAF: 24.36.43, MAGNAFLOW: 61806D, 65815D, MTS: 4.4187, 4.4311, SAAB: 850242, 5850125, 5850126, 55354248, 55354249, 55559633, 55559634, SIGAM: 13198, 40194, VAUXHALL: 850242, 5850125, 5850126, 55354248, 55354249, 55559633, VENEPORTE: OP40076K, OP40083K, WALKER: 20845, 28191, 28333. The only way to be 100% sure that the part will fit your vehicle is to check the part number on your original unit matches one of the above. Any information in the compatibility table is for reference only and there may be unspecified choice options. If a part is faulty a replacement will be sent out after the return and testing of the old unit. Labour claims & consequential loss claims are never accepted. The item "BM Front Premium Exhaust Catalytic Converter Cat BM80303H 3 YEAR WARRANTY" is in sale since Saturday, May 26, 2018. This item is in the category "Vehicle Parts & Accessories\Car Parts\Exhausts & Exhaust Parts\Catalytic Converters & Parts". The seller is "rtgroup11" and is located in PR25 3US. This item can be shipped to United Kingdom.